It's nice to post a report on a race that went well for a change. I'm sure the near perfect weather conditions played a big factor in this being a more successful outing for me. It seems no matter how much acclimating I do to the heat and humidity, I never run well until the cooler temps of Autumn return. But I did learn many years ago that if I train hard and suffer through the miserable heat and humidity of the NC Summer I will be rewarded with days like this past Saturday. I was able to leave early enough to the park to set up my campsite well before dark and packet pick-up. I only made the decision to go ahead of time about a week ago and the cooler drier air was a big factor in that decision. It is less than an hours drive to the park from home but I knew it would be fun to hang out with lots of my running friends. It was fun but I still needed some rest so I was in the tent by 9:30. It was a chilly night and the ground is hard so sleep didn't not come easily. I did get some sleep because I remember having one really wonderful dream but that was followed by a nightmare. It was pretty cool hearing the coyotes and the lone moowing of a cow way off in the distance. I finally crawled out at 6 and made my coffee and enjoyed a delicious breakfast of frosted brown sugar cinnamon Pop-Tarts. ( the breakfast of champions and secret to my success?) With only 15 minutes to the start we finally made our way over to the starting area where I found quite a few of my NCRC, MTC and and other friends. By now the sun was peaking up over the trees, it was in the low 50's and just a gorgeous morning. I was feeling confident and I had a plan. Now was the time to see if my feelings were justified and put that plan to the test. As I mentioned in the preview post, I had originally signed up for this as a training run but now I was hoping to lay it on the line. I love racing ! My friend Charles West had suggested when I told him I planned to race it that he thought I should just run it easy and save it for MMTR but my mind was made up and I know with my current level of fitness I will have plenty of time to recover for a strong effort there. So I lined up with my training partner Amy Surrette and explained my strategy to her. We were both hoping that she would be able to share at least some of the miles. That plan was to take it easy the first 1.5 miles to get warmed up and see if there was some zip in the legs, then get over the summit climb at about 2.5 miles into the race without pushing the pace and if everything felt good then I would open it up and see what I had. That is exactly what we did. I felt very relaxed but after the first mile in 9:46 Amy questioned whether or not this was an easy pace. It did feel very easy and relaxed to me but she wasn't feeling quite as spiffy as I was. Once we began the ascent to the summit she began to drop behind. I turned around and took a picture of her just behind me as I neared the top but when I reached the summit it was hammer time. Now I was committed to the challenge. I was either going to have a good race or blow up trying. It didn't take long for me to realize that it was indeed going to be a good day for me. I knocked out a couple of miles in 8:55 and 9:05 as the course was mostly gradually downhill or flat for the next several miles. It was so sweet to find myself in the zone for the next couple of hours. I was very relaxed but focused and looking back now I am amazed at how I just seemed to float over the rocks and roots. I was soon back down to the bottom land along Little Fishing Creek and some flat running for awhile. The plan the remainder of the race was to run strong and steady on the flats, bomb the downhills and then use the uphills to recover by slowing the pace and keeping the effort spread evenly. This was working perfectly as I completed the first of three laps on the course just a little faster than my fantasy goal pace. I headed out on lap two with confidence but still aware there was a long way to go so I resisted the urge to push any harder. By now the race was spread out quite a bit and I would have no more 10 milers coming up on me. There was a group of several runners that had been around me for most of the race and for the next few miles we would continue to leap frog. I would pull away on the flats and downhills but because I was backing off the pace on the hills, they would catch or pass me. As we came into the aid station around mile 12, I stopped to have my water bottle refilled and headed out before any of that group and I took off bombing down the single track once again throwing in a 9:38 and 9:24 mile back down to the Creek. I had not seen another runner in front of me since leaving the aid station and when I got back to the bridge I was joking with the volunteers that I must be winning the race now. All the way to the next aid station at the beginning of the Bluff Loop and still no one in sight. I continued running well but slightly slower than the first loop and by the time I finished that second loop I still had not seen another runner in front of me. As I headed out on loop three I knew I would not get my fantasy goal but my realistic goal of 4:30 was still within reach if I could just hold it together. As I left the aid station and headed back into the woods I would run my last sub 10 mile in 9:59. Soon afterwards I was a little surprised to have a young lady pass me on the first climb of the tough Dam Site Trail. She obviously had paced herself well and I encouraged her onward. Soon after I began the last climb up the summit and was happy to still be able to run a portion of it. I caught two guys at the top and was still able to push the pace once again albeit slower than the previous two trips and quickly left them well behind. By now I was really having to dig deep to keep up the pace. I was certainly slowing down but still able to hold a decent pace. I stopped briefly at the aid station for a gel and some water before heading off on the single track once again. Bryant Dukes passed me here which surprised me. Not that he passed me but that I was ever in front of him to begin with. I was now past the infamous "wall" but still feeling pretty good. I was sill able to push the pace down to the creek. I met Charles West coming up the trail doing volunteer duty and it was nice to see him and get some encouragement. Even with the brief stop I ran that 21st mile in 10:12. I ran over the bridge for the last time and was hoping to continue to push a steady pace along the flat creek section but it was soon obvious that the zip was now gone. The roots I had floated over earlier had now become obstacles that took extra effort to lift the feet over and I was having to step much more carefully adding precious seconds to my pace. I made it into the last aid station with 3 miles to go knowing I would not be able to slow any more if I was going to get that 4:30. A young man passed me and I tried to keep him in sight as I made an effort to push the pace on the gently sloping trail back down to the Creek. Well, the effort was there but the pace was not and I was getting ever slower and slower. I was very surprised again that I passed Byrant back in these last few miles but he was having some cramping issues. Despite the slow down I still had only been passed by three people since mile 12 and I just passed one of those back but my main concern was trying not to slow any more and hopefully still squeak under my goal pace. 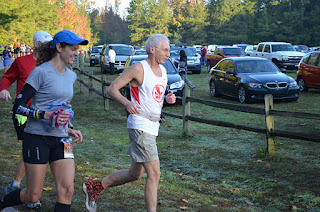 I was still holding out hope for an age group placing although I had figured that was a long shot some of the volunteers had told me I was first of the old guys but I thought there were probably a few that just didn't look as old as I do with my very thin, grey hair. Well, mile 25 took me almost 12:30 minutes and that was the end of my chance at 4:30 and then to add to the insult, I was passed with 1.5 to go by a man that I was guessing had to be in my age group. As slow as I was I was still going as hard as my body would allow over these last couple of tough rolling miles determined to finish as fast as I could and place as high as possible. and then finally I was out of the woods and onto the meadow with the cheers and finish line in sight. I was able to cross over in 4:32:53 and although it was not quite my goal I was very very happy with it and my effort. So sweet to be able to give it a good effort all day. The time is especially satisfying considering I ran 50 miles at Hinson Lake three weeks ago and have put in a lot of solid training miles since then with no taper for this race. I spent the rest of the afternoon hanging with my running buddies and watching the rest of them come in to finish. I was happy to take 3rd in my age group and yes, the gentleman that passed me was 2nd. He obviously ran a well paced race. The 1st place guy was from another planet and ran under 4 hours. 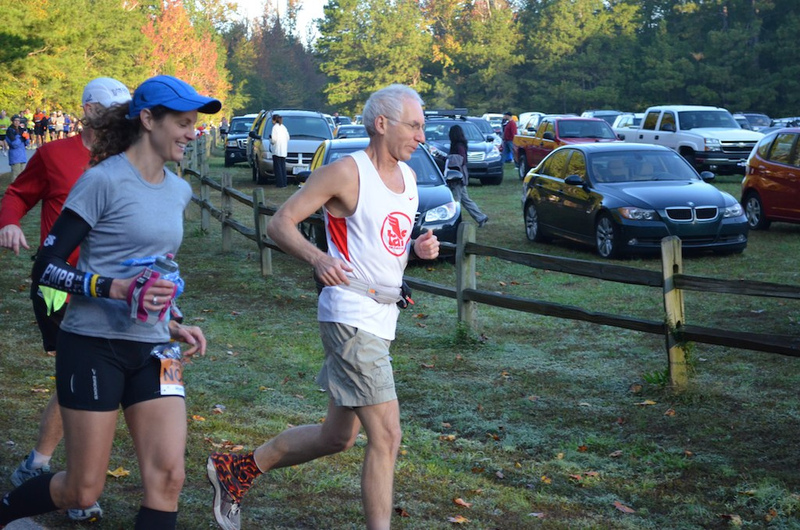 I was very happy that The Trail Angel Laura was able to win the women's overall title and just a week after winning the New River 50k. She is awesome ! Amy had some struggles out there but as always toughed it out and was surprised and happy to find she had won 3rd in her age group. Unfortunately my other training partner and dear friend The Ultra Angel Jenn, who was running today with her trail name Bat Girl and had the shirt to go with it was having a tough time out there. I was getting worried when it was well past her expected time but she brought it home with some company from our friend Rhonda and was all smiles so everything was good. Lots of other friends had good and bad days but all had fun. In particular we were very happy to see Ben Dillon finish his first marathon in nearly two years after back surgery and two cataract surgeries. This was a wonderful day and I have to say many thanks to all the race committee and their volunteers and sponsors for putting on a quality event. Here is a link to the results. I'll try to post some pics and videos soon. When I saw you at 20.2 (Firetower aid station) you were 'singing a song' . . . literally! You looked to be in GREAT shape! Congratulation and a great performance!